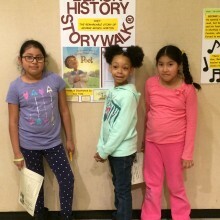 Children at White Plains Public Library are learning about George Moses Horton as they walk The Trove's Black History StoryWalk® which is on display in the Library's art gallery during the month of February through Sunday, March 13, 2016. The StoryWalk® is based on the book: Poet: The Remarkable Story of George Moses Horton, written and illustrated by Don Tate. George Moses Horton was a slave who grew up working long hours on a North Carolina farm. Though unable to attend school, he was determined and taught himself to read. While he tended his master’s cattle, he composed verses in his head and recited them as he sold fruit and vegetables. Later he wrote to protest enslavement and became the first African-American man to be published. 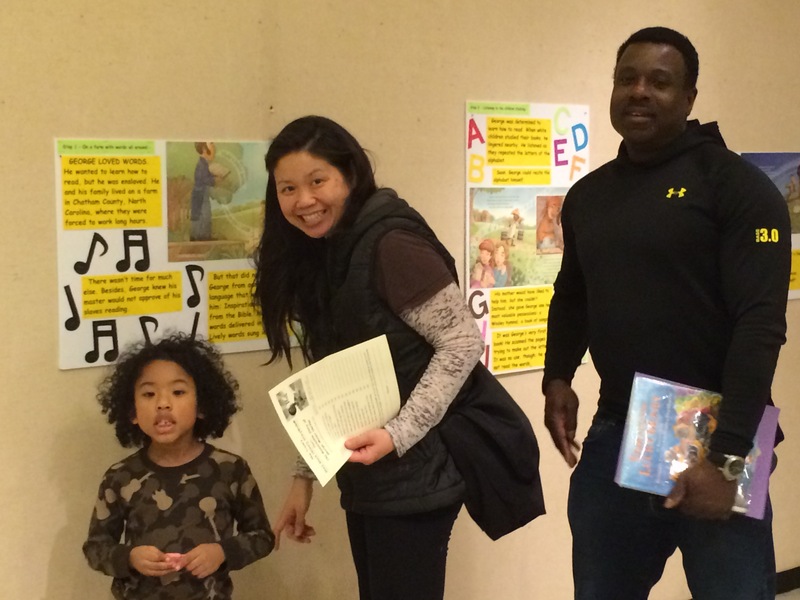 Before starting the StoryWalk®, children in grades 1 through 6 are asked to pick up a form at The Compass (information desk) in The Trove. The first stop is to the left side of the entrance to the art gallery. Children and families should follow the arrows and proceed at their own pace through the rest of the stops, completing the form as they go along. The completed form should be turned in at the Compass for a prize and to be entered in the final drawing box. Note: The StoryWalk® Project was created by Anne Ferguson of Montpelier, VT and developed in collaboration with the Vermont Bicycle & Pedestrian Coalition and the Kellogg Hubbard Library. The title of your article is highly inappropriate and should be retitled immediately. Its very offensive. “With Slave Poet” why not just use his name. Thank you for your comment. I will pass this on to the author of the post.